44 Lenin Avenue » A chapel where a cathedral once stood? One fun aspect of the 44 Lenina project is that this central part of Tomsk continues to undergo revision, a revision intimately associated with the region’s history. Just a stone’s throw from the building is the main, central square in Tomsk, now a large park with fountains, trees, and several plaques and monuments. This spot had once housed Siberia’s largest cathedral, the Trinity Cathedral, modeled on the Cathedral of Christ the Savior in Moscow. Interestingly, although Khabarov (who designed 44 Lenina) was not the cathedral’s main architect, he became the project manager for the cathedral in the 1880s. It took decades to build, and was finally consecrated in 1900. 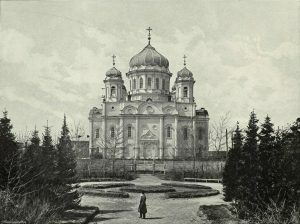 Like the Cathedral of Christ the Savior, Trinity Cathedral was demolished during the early Stalin era. Trinity Cathedral c. 1898. Image via Wikimedia Commons. Public domain. Now, the city of Tomsk is considering plans to re-design the square (currently, as in pre-revolutionary times, called “New Cathedral Square”), and there is a movement, as part of this redesign, to have a small chapel built on the site where the cathedral once stood. I’ve linked to a Russian-language report on the issue (“A Chapel on New Cathedral? For and Against“) via Tomsk’s TV2. You can see some photos, at that link, of the designs for the chapel.